Capture of Nieuport, after 5 days; 60 cannon; 2,000 prisoners. 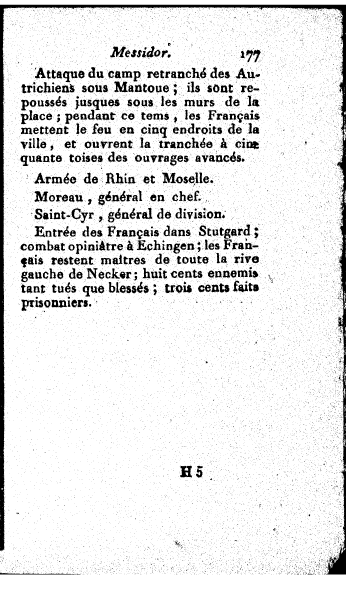 Attack of the Austrian entrenched camp under Mantoue; they are repulsed until the town walls; meanwhile, the French kindle the town in 5 places and open a trench near the advanced fortifications. 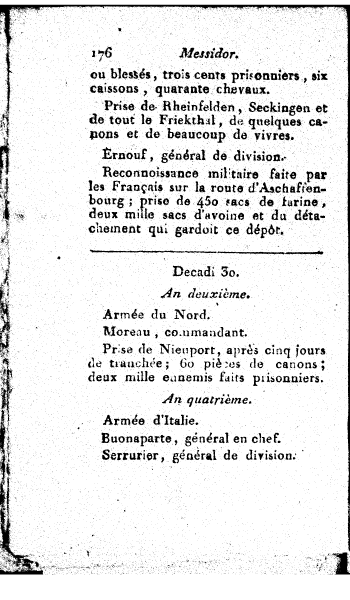 The French enter Stutgard; fierce fight at Echingen; the French keep the whole left bank of Necker; 800 enemies killed and wounded; 300 prisoners. Copyright 2004, 2011, Jean Forget and les Mongueurs de Perl, except the "Calendrier Militaire" fac-simile, all rights reserved.